Humans love chocolate on Valentines Day. I trust you all know that chocolate is dangerous for your dogs. That's why we have Pawsitively Homemade treats that have no artificial ingredients and come in special needs versions such as wheat free and gluten free. Awesome! We've had fun trying these yummy treats at our house. In fact, they smell so good I was tempted to try one myself. Don't worry, I managed to hold back, but it wasn't easy. I love peanut butter cookies! Tanner and Oliver are continuing to enjoy an afternoon snack after their photo shoots and training sessions. I'ts nice to give them something they really look forward to when they work so very hard for it. 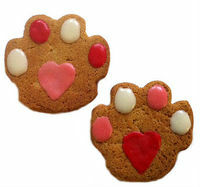 Today's winners of a box of assorted Pawsitively Homemade Valentine treats are Dh Hd, L. Paylor, D Burghardt, K. Volz, S Weinstein, and D. Ellis. You'll each receive an email from AllThingsDogBlog@gmail.com requesting your mailing address for the shipment. Read the information and be sure to include everything I request. If you do not see an email by 6 PM ET, please check your spam file or email me at the address just mentioned. Congratulations to you all. Just remember that a little of a good thing goes a long way. Limit treats according to your dog's size and tummy sensitivity, allowing him to enjoy the entire box over a longer period. For best results, I recommend refrigerating the treats to preserve them for extended noshing. Enjoy!